Encorafenib and Binimetinib Combination Treatment Demonstrates 33.6 Month Median Overall Survival (OS) in Patients with BRAF-Mutant Melanoma in Phase 3 COLUMBUS Trial | Array BioPharma Inc.
BOULDER, Colo. and CASTRES, France, Feb. 6, 2018 /PRNewswire/ -- Array BioPharma Inc. (Nasdaq: ARRY) and Pierre Fabre today announced results of the planned analysis of overall survival (OS) from the pivotal Phase 3 COLUMBUS trial in patients with BRAF-mutant melanoma. Treatment with the combination of encorafenib 450 mg daily and binimetinib 45 mg twice daily (COMBO450) reduced the risk of death compared to treatment with vemurafenib 960 mg daily [hazard ratio (HR) of 0.61, [95% CI 0.47, 0.79, p <0.001]. Median OS was 33.6 months for patients treated with COMBO450, compared to 16.9 months for patients treated with vemurafenib as a monotherapy. 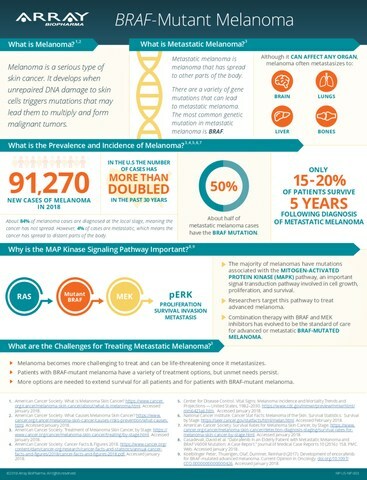 "Many patients with BRAF-mutant melanoma still face significant challenges managing their disease, and there remains a substantial need for well-tolerated treatments that delay disease progression and improve overall survival," said Keith T. Flaherty, M.D., Director of the Termeer Center for Targeted Therapy, Massachusetts General Hospital Cancer Center and Professor of Medicine, Harvard Medical School. "This data suggests that the combination of encorafenib and binimetinib may have the potential to become a meaningful new therapy for patients with advanced BRAF-mutant melanoma." At the time of the planned analysis comparing COMBO450 to vemurafenib monotherapy, a preliminary analysis of OS in patients treated with 300 mg encorafenib alone daily (ENCO300), demonstrated a median OS of 23.5 months. "We are excited to report these overall survival results from the COLUMBUS trial," said Victor Sandor, M.D., Chief Medical Officer, Array BioPharma. "This encouraging overall survival finding further validates previously reported median progression-free survival and overall response rate results, and taken together with the attractive tolerability profile, these data suggest that the combination of encorafenib with binimetinib has the potential to become a promising new treatment option for these patients." As previously reported, the combination of encorafenib and binimetinib was generally well-tolerated. Grade 3/4 adverse events (AEs) that occurred in more than 5% of patients receiving the combination were increased gamma-glutamyltransferase (GGT) (9%), increased blood creatine phosphokinase (CK) (7%) and hypertension (6%). The incidence of selected any grade AEs of special interest, defined based on toxicities commonly associated with commercially available BRAF+MEK-inhibitor treatments for patients receiving the combination of encorafenib and binimetinib included: rash (23%), pyrexia (18%), retinal pigment epithelial detachment (13%) and photosensitivity (5%). Full safety results of COLUMBUS Part 1 were presented at the 2016 Society for Melanoma Research Annual Congress. The U.S. Food and Drug Administration (FDA) is currently reviewing the New Drug Applications to support use of the combination of encorafenib and binimetinib for the treatment of patients with BRAF-mutant advanced, unresectable or metastatic melanoma. The FDA set a target action date under the Prescription Drug User Fee Act (PDUFA) of June 30, 2018 for both applications. In addition, the European Medicines Agency (EMA), as well as the Swiss Medicines Agency (Swissmedic) and the Australian Therapeutic Goods Administration (TGA), is reviewing the Marketing Authorization Applications for encorafenib and binimetinib. A detailed update from the COLUMBUS trial will be presented at an upcoming medical congress. In Part 1, 577 patients were randomized 1:1:1 to receive COMBO450, ENCO300, or vemurafenib 960 mg alone. The dose of encorafenib in the combination arm is 50% higher than the single agent maximum tolerated dose of 300 mg. A higher dose of encorafenib was possible due to improved tolerability when combined with binimetinib. The primary endpoint for the COLUMBUS trial was a median progression-free survival (mPFS) comparison of the COMBO450 arm versus vemurafenib. mPFS is determined based on tumor assessment (RECIST version 1.1 criteria) by a Blinded Independent Central Review (BICR). Secondary endpoints include a comparison of the mPFS of ENCO300 to that of the COMBO450 arm and a comparison of OS for the COMBO450 arm to that of vemurafenib alone. Results from Part 1 of the COLUMBUS trial previously presented at the 2016 Society for Melanoma Research Annual Congress, showed that COMBO450 more than doubled median progression free survival (mPFS) in patients with advanced BRAF-mutant melanoma, with a mPFS of 14.9 months compared with 7.3 months observed with vemurafenib [HR 0.54, (95% CI 0.41-0.71, P<0.001)]. In the secondary mPFS comparison of COMBO450 to ENCO300, ENCO300 demonstrated a mPFS of 9.6 months [HR 0.75, (95% CI 0.56-1.00, p=0.051)]. In Part 2, 344 patients were randomized 3:1 to receive encorafenib 300 mg plus binimetinib 45 mg (COMBO300) or ENCO300. Part 2 was designed to provide additional data to help evaluate the contribution of binimetinib to the combination of encorafenib and binimetinib. As the secondary endpoint comparison of mPFS between the COMBO450 arm and ENCO300 arm in Part 1 did not achieve statistical significance, the planned analysis of OS is descriptive. Array BioPharma Inc. is a biopharmaceutical company focused on the discovery, development and commercialization of targeted small molecule drugs to treat patients afflicted with cancer. Nine registration studies are currently advancing related to seven Array-owned or partnered drugs: encorafenib (LGX818), binimetinib (MEK162), selumetinib (partnered with AstraZeneca), danoprevir (partnered with Roche), ipatasertib (partnered with Genentech), larotrectinib (partnered with Loxo Oncology) and tucatinib (partnered with Cascadian Therapeutics). For more information on Array, please go to www.arraybiopharma.com. With a portfolio representing a continuum of activities spanning from prescription drugs and consumer healthcare products to dermo-cosmetics, Pierre Fabre is the 2nd largest dermo-cosmetics laboratory in the world, the 2nd largest private French pharmaceutical group and the market leader in France for products sold over the counter in pharmacies. Its portfolio includes several global brands and franchises among which Eau Thermale Avène - the worldwide dermo-cosmetic market leader - Klorane, Ducray, René Furterer, A-Derma, Galénic, Elancyl, Naturactive, Pierre Fabre Health Care, Pierre Fabre Oral Care, Pierre Fabre Dermatologie and Pierre Fabre Oncologie. In 2016, Pierre Fabre generated 2,282 million euros in revenues, of which 60% came from its international business and 59% from its dermo-cosmetics division. Pierre Fabre, which has always been headquartered in the South-West of France, counts more than 13,000 employees worldwide, owns subsidiaries and offices in 47 countries and enjoys distribution agreements in over 130 countries. In 2016, Pierre Fabre dedicated ca. 195 million euros to its R&D efforts, split between oncology, central nervous system, consumer healthcare, dermatology and dermo-cosmetics. The independent French certification group AFNOR audited Pierre Fabre for its corporate social responsibility policy at the "exemplary" level, according to the ISO 26000 standard for CSR. This press release contains forward-looking statements within the meaning of the Private Securities Litigation Reform Act of 1995, including statements about the future development plans of encorafenib and binimetinib; expectations regarding approval of encorafenib and binimetinib for BRAF-mutant melanoma and timing of such approvals; expectations that events will occur that will result in greater value for Array; and the potential for the results of current and future clinical trials to support regulatory approval or the marketing success of encorafenib and binimetinib. Specifically, there is no assurance that results from the BEACON CRC and COLUMBUS trials will satisfy the requirements of regulatory authorities necessary for approval. These statements involve significant risks and uncertainties, including those discussed in our most recent annual report filed on Form 10-K, in our quarterly reports filed on Form 10-Q, and in other reports filed by Array with the Securities and Exchange Commission. Because these statements reflect our current expectations concerning future events, our actual results could differ materially from those anticipated in these forward-looking statements as a result of many factors. These factors include, but are not limited to, the determination by the FDA, EMA or other regulatory agencies that results from clinical trials are not sufficient to support registration or marketing approval of encorafenib and binimetinib; our ability to effectively and timely conduct clinical trials in light of increasing costs and difficulties in locating appropriate trial sites and in enrolling patients who meet the criteria for certain clinical trials; risks associated with our dependence on third-party service providers to successfully conduct clinical trials and to manufacture drug substance and product within and outside the U.S.; our ability to grow and successfully develop commercialization capabilities; our ability to achieve and maintain profitability and maintain sufficient cash resources; and our ability to attract and retain experienced scientists and management. We are providing this information as of February 6, 2018. We undertake no duty to update any forward-looking statements to reflect the occurrence of events or circumstances after the date of such statements or of anticipated or unanticipated events that alter any assumptions underlying such statements.